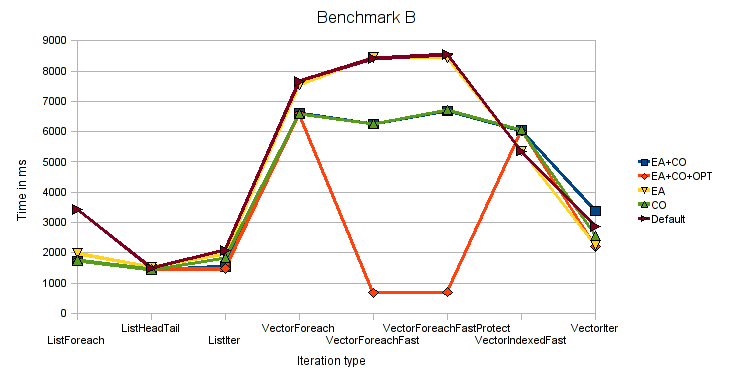 Internal iterators like foreach tend to do very well in micro-benchmarks on the JVM. In fact, they often do as well as the equivalent manual while or for loop. There is a catch, however, and it’s easy to miss it in micro-benchmarks. Various approaches are used for each benchmark with various collections types. One weakness of the these benchmarks is that they don’t include a verification mechanism to ensure that all benchmarks produce the same result. However, they include code that tries to prevent the JIT from performing unfair optimisations (e.g. print something if an element in the collection matches a certain condition). The original results produced by Tiark can be found here. JDK 6 Update 18 is scheduled to be released on Q4, 2009 and it includes HotSpot 16. Even though JDK 6 Update 14 (HotSpot 14) introduced compressed references and scalar replacement, HotSpot 16 includes improved compressed references and many crucial fixes to both features. According to my testing these features are now approaching production-level stability and the OpenJDK engineers seem to agree as they are both enabled by default in HotSpot 17 (which will eventually hit JDK6 too). Interested in how these features would affect the performance in these benchmarks, I ran them with various combinations. I also added Scala’s compiler -optimise flag in some cases. The original benchmark from Tiark used 3 collection types: array (java.util.ArrayList), list (scala.List, immutable single linked list) and vector (earlier version of immutable vector that has recently been added to Scala 2.8). I added JVM arrays and they are shown as “rawarray” in the charts. Finally, we get to the actual numbers. Compressed references is a _huge_ win. RawArrayIndexed went from 500ms to 142ms and many of the vector operations were much faster. Escape analysis (which enables scalar replacement) doesn’t seem to have much of an effect. scalac -optimise doesn’t seem to have much of an effect. foreach is misleadingly fast in micro-benchmarks, but it’s easy to bring it down to earth. RawArrayForeach performs similarly to RawArrayIndexed, but RawArrayForeachMega is 10 times slower. The latter simply calls foreach with a few different anonymous functions during the collection creation phase causing the call site to become megamorphic. Once this happens, the only hope for good performance is that the foreach method gets inlined and it doesn’t seem to happen here. With this in mind, it seems like ticket 1338 (Optimize simple for loops) is a good idea. Once again, compressed references are a large factor in some benchmarks (halving the time taken in some cases). The new bit of information is that scalac -optimise causes a huge improvement in VectorForeachFast and VectorForeachFastProtect. This makes sense once one considers one of the findings from the previous benchmark. We said that inlining of foreach is of extreme importance once a call site is megamorphic and this is precisely what -optimise does in this case (and the JVM fails to do so at runtime otherwise). Sadly, -optimise cannot do this safely in many cases as it’s shown by the results for VectorForeach. Once again, compressed references provide a nice boost. Seems like this option is a winner in 64-bit JVMs (if you don’t need a heap larger than 32GB), it saves memory and gives better performance. The usual disclaimer applies though, you should benchmark your own application instead of relying on micro-benchmarks when deciding what JVM options to use. The complete results are also available. Feel free to play with the source code and provide your own numbers, fixes and/or improvements. Delete this as spam if you’d like (it’s off topic), but the popup that comes up when mousing over links is pretty distracting when trying to read the article. Content was good, just hard to stick to with the popups. Thanks for the feedback. I’ve disabled the pop-ups. You should really consider redoing your graphs as bar graphs rather than line graphs. They might look pretty, but you should only use line graphs for continuous data, not across categories.